Throughout December 2017 and January 2018, Bestfly and ExecuJet South Africa offered private charter flights to Antarctica for its first season. In addition to using its own fleet that includes a G550, left, to reach destinations, Bestfly uses other operators’ aircraft including a ski-equipped DC-3, right. The second season of flights to Antartica will continue late this year and into early 2019. Angola’s Bestfly, which manages 13 aircraft and operates an FBO in the oil-rich west-African country, is to operate a second season of luxury charter flights to Antarctica this winter. 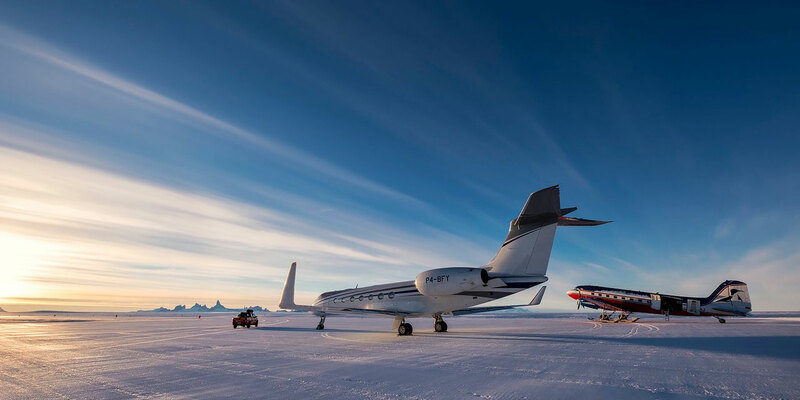 The company was approached by ExecuJet South Africa last year to operate private flights to Antarctica, in a three-year project on behalf of UK-based luxury-tour operator White Desert. Work on the plan to launch packages to the Southern Hemisphere began in April 2017. The first season was the Southern Hemisphere summer of 2017/2018, and during the months of December and January, t﻿he company flew 16 flights to Wolf’s Fang Runway. Available packages include day-long trips to Wolf’s Fang, a blue-ice runway rehabilitated by White Desert in 2016; four-day "Ice and Mountains" packages; and week-long excursions to penguin habitats as well as the geographic South Pole, usually in parties of 12. The flight from Cape Town, South Africa to Antarctica takes approximately five hours. Thorough contingency plans are in place for such excursions. “We have contingency plans, as our minimum weather requirements are significantly higher than [those] normally used. The plane is always fueled for return flights in case of an in-flight emergency,” he said. In addition, in case of a break-down in Antarctica, the company has a ﻿back-up airplane that can be dispatched for help as well as a permanent technical team in Cape Town with a basic kit of spares ready to be deployed. The company also uses other operators’ aircraft to reach the location, including a DC-3, Ilyushin Il-76, Falcon 7X, and Boeing 757, while a G650 is also doing flights for other projects, Pereira said. Last year, Bestfly and ExecuJet planned to operate between 10 and 15 flights to Antarctica. Bestfly operates the trips as full charters and had to apply for special operations approval from the Aruba DCA, under which its AOC is issued and the airplane registered. “They sent a cold-weather and landing-on-ice specialist to evaluate the processes and procedures that we established before the first commercial flight could be performed," Pereira said. "We had to submit the documents and procedures that we planned to use well ahead of time for their evaluation and pre-approval, before a proving flight was performed, allowing the inspectors to evaluate our operation in the harsh conditions." Handling in Cape Town is done by ExecuJet, while in Antarctica there is no real need for it, as Wolf’s Fang is a private strip and White Desert handles all the logistics. “Flight planning is quite similar to the other flights we do—just with extra precautionary measures,” he said. “On White Desert’s part, though, it was a major challenge. They had to actually build a runway from scratch on ice and make it safe for a jet the size of a G550 to land,” Pereira said. White Desert submitted an interim environmental evaluation report to the UK Foreign Office in April 2016. The Wolf’s Fang runway is a 2,500-meter-long (8,202 feet) site with QFU 201 (magnetic) or 173 (true). Located at south 71 degrees, it is built on glacial ice, with a level of compaction similar to a concrete runway. Braking coefficients are similar to those for landing on a wet runway. “On actual flights, we do maintain a weather watch, where staff at Wolf’s Fang send hourly weather observations and runway-friction measurements. If they fall below our established minimums, we return to Cape Town,” he said. ATC services for the flight to Antarctica are in place. “There is support from the FAJO Oceanic FIR until descent. From there, Antarctica TIBA [traffic information broadcast by aircraft] procedures are used, as well as radio communication with operators based in Novo and Wolf’s Fang,” he said. Bestfly uses ArincDirect and FlightAware tracking to stay in touch with both its Angolan headquarters and ExecuJet Cape Town. “We are in permanent contact through flight tracking with the plane, even when on the ground in Antarctica. We communicate with both ExecuJet in South Africa and our operations control center in Angola, as well as our office in Aruba,” Pereira said. “We are in the process of confirming the arrangement with Bestfly for the 2018-19 season and fully intend to use their services again. We are looking to perform approximately 20 flights this coming year,” Patrick Woodhead, managing director, White Desert, told AIN. Bestfly obtained an Angola AOC in 2015 and an Aruba AOC in 2017 and now has the domestic and international approvals in place for flights anywhere in the world. “We have [third-country operator] approval and can fly worldwide unrestricted," said managing director and CEO Nuno Pereira. "We are, together with TAAG Angola Airlines, the only Angola-based company to be authorized to fly to Europe commercially—and worldwide, for that matter—without any restriction,” he said. Bestfly’s managed fleet includes the G550, a G450, a Falcon 900, a Global Express, and a Challenger 605. In June the company signed an agreement for its first BBJ and is planning to add one more G550 before year-end. The Aruba office confers new opportunities for charter. “With the Aruba branch, we opened the opportunity of expanding our management services to other markets rather than only concentrating on Angola, [our] main market,” he said, adding that the company established the Aruba branch mainly to be able to secure an unrestricted AOC. In June, Bestfly received approval from ExxonMobil to fly its staff on its corporate aircraft in West Africa. The company achieved similar approval from Chevron two years ago.